These cupcakes will provide plenty of delight and freight to your next Halloween get together. If you like the cupcake casings/liners and toppers you can purchase them here. 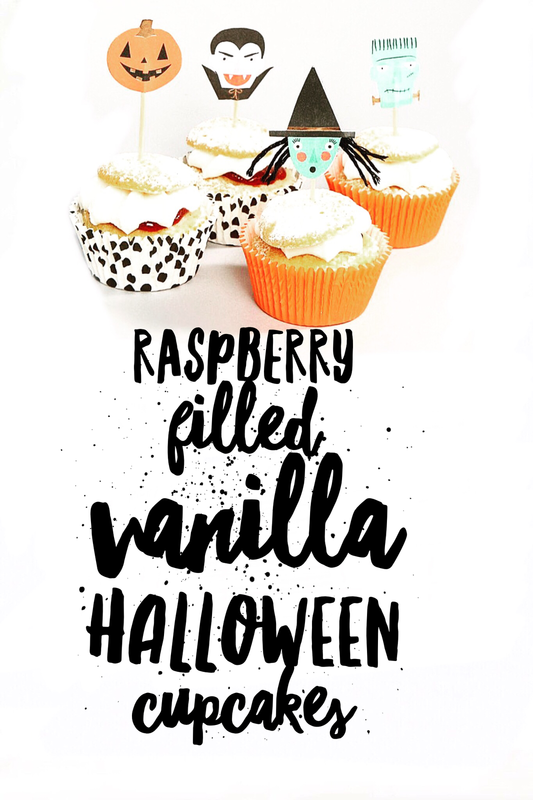 Not only are these cupcakes absolutely adorable, but I also used my go to FAVORITE sour cream vanilla cake recipe. This cake is seriously moist and comes out tasting exactly like the bakery! I hope you enjoy! Preheat oven to 350 degrees. Grease two round 9" cake pans. (If you are extra fancy, add parchment circles to your pans and spray/grease). Wisk flour, baking soda and baking powder to combine. In a separate bowl, combine milk, sour cream and vanilla. Stir with fork. In mixer with paddle, (or if you're super strong, by hand with a spatula) mix butter until fluffy. Add sugar, beat 3-4 minutes until thoroughly combined. Scrape sides of bowl and add eggs, one at a time. Add dry ingredients alternatively with the wet ingredients. Begin and end with dry ingredients. Try to not overmix. Bake 30 minutes at 350 degrees. Let cool in pans 15 minutes. Place raspberries in a small saucepan with your water, cornstarch sugar. Boil about 5 minutes, stirring occasionally and let cool completely. Cream together softened cream cheese and half the powdered sugar. Set aside. Add remaining ingredients in a large mixing bowl until combined. With an electric mixer (or by hand) mix on high until stiff peaks form. Add cream cheese mixture, continue beating on high until thoroughly combined.